With the first extreme heat alert issued for Toronto, people are looking for ways to cool off. In the heart of downtown, it can be tough to find any relief from the heat, except for maybe running through the water fountains spurting at Yonge-Dundas Square. If splashing through water in front of hundreds of people isn’t your thing, the next best way to (temporarily) beat the heat is with a cold drink on a nice patio. To save you some time, we’ve compiled a list of the best patios around Ryerson for any scorcher throughout the summer or school year. 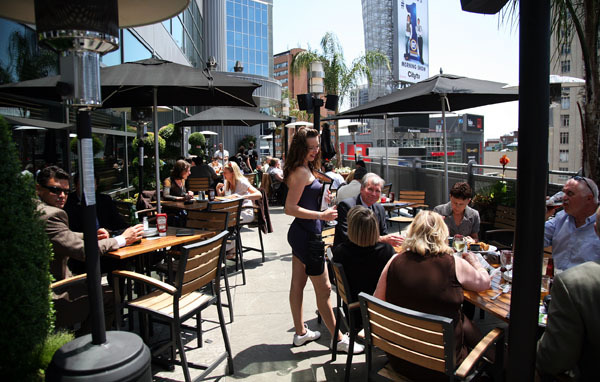 As far as urban patios go, they can’t really get better than the one Jack Astor’s and Milestone’s share (basically one long patio sectioned off for each restaurant). Both patios are pretty skinny and wrap around the 10 Dundas St. building, but the view is what makes them amazing. On the top floor of the building, you have a great vantage point for whatever’s going on at Yonge-Dundas Sqaure and the ability to see much of downtown Toronto while you eat. While the patios and drink menus aren’t much different, the two restaurants do offer different food experiences. Jack Astor’s is perfect for anything casual and offers great burgers, sandwiches, nachos and surprisingly, bruschetta. Head over to Milestone’s for something a little more professional – it’s basically a classy Jack Astor’s featuring dishes like kobe style classic meatloaf and grilled chicken penne asiago. 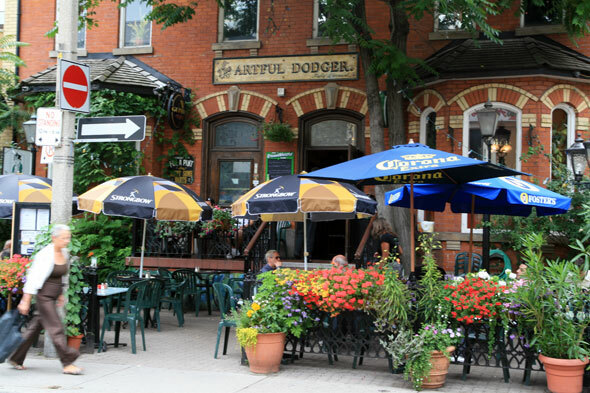 Tucked in on Isabella St., just north of Yonge and Wellesley, the Artful Dodger offers seating out front that can fit 50 people. However, the real treasure is its shaded back patio. Surrounded by shrubbery and with a wooden overhang, this back patio can make you forget that Yonge St. is just a few steps away. Two words to perfectly describe this pub are quaint and cozy. With a full menu and reasonably priced drinks, this is a great small getaway that offers a unique experience for those looking for a break from the hustle and bustle of downtown Toronto. Walk a few minutes up to Yonge and College and you will find the Screen Lounge door squeezed in beside Fran’s and the Centre Francophone. Up two flights of stairs and you are on the gorgeous 2,000 square foot rooftop patio, complete with tables and couches to lounge on. The main restaurant is downstairs, but the patio comes complete with a full service bar and the ability to order appetizers or desserts (try the cheesecake!). There’s also a DJ stage above the bar, making this a perfect place to hold a party or have a night out with your friends. While the drinks are a little pricey, it’s definitely a place to check out if you’re looking for a patio with a different style than the usual bars. 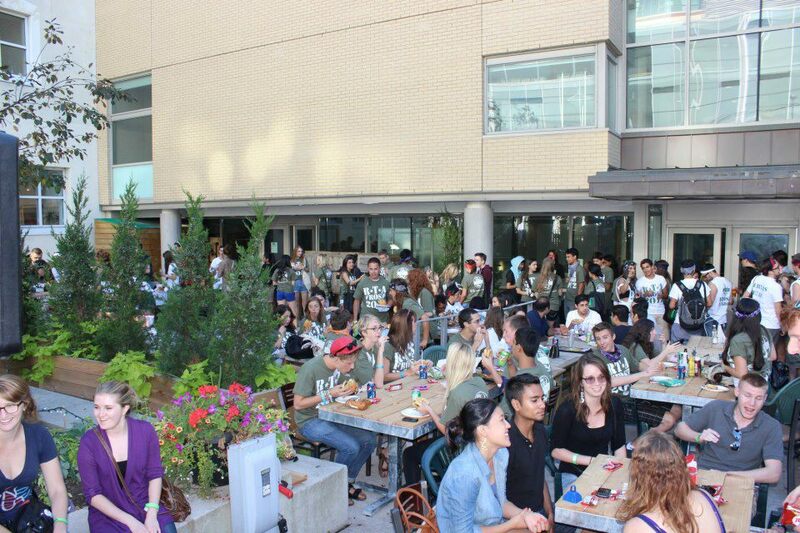 While it’s definitely not the nicest patio on the list, Ryerson’s campus pub comes with a 1,300 square foot of outdoor seating – a decent size by Toronto standards. The food is decent, the staff are nice and it’s the perfect place to hang out and meet other Ryerson students. Oh, and did I mention the drinks are cheap? Like ridiculously cheap, especially for being in the centre of downtown Toronto. The most expensive pint – Heineken – comes in at around $6. Where else you gonna get a deal like that? On Elm St. just west of Yonge, The Queen and Beaver Public House looks like a house turned into a pub (hence the name) and features two great patios. For those who want to watch the world go by while they enjoy their drinks, a small sidewalk patio gives a good vantage point. If you’re looking for something quieter, the second story patio (also small) overlooking the street is the place for you. The pub offers seven beers on tap and an array of unique bottles from Ontario, Quebec and England that go along with classic British dishes. While the food may be a bit pricey for students (all hovering around $22), the distinctive pints are very reasonably priced, costing no more than $7.50. While these are some of our favourite patios around Ryerson, there are definitely many more we have yet to try. Do you have a favourite patio you think should have made this list? Let us know in the comments!